Thanda is located in the heart of Zululand. With this location comes responsibility to the Zulu People and the Zulu Culture, which have existed in this area for centuries. Most of the personnel at Thanda come from the surrounding local communities and Thanda has close relationships with the community leaders and the people. Both sides benefit greatly from these good relationships! For the interested guests – from all over the world – Thanda is not only a superb place to experience the African bush but also an ideal base to explore Zulu culture and customs. Visits to a traditional Zulu homesteads and to local schools can enhance the appreciation for the rural life in South Africa. A visit to a Sangoma (Zulu Spiritual Adviser) can give a great insight into the Zulu believes connecting God, Nature and the Ancestors. There will be a series of blog messages and images documenting this unique part of the Thanda experience. This first blog/images show a group of Thanda guests with the children at a local school. Many guests support the schools by donating supplies and toys when visiting them during their stay in South Africa. 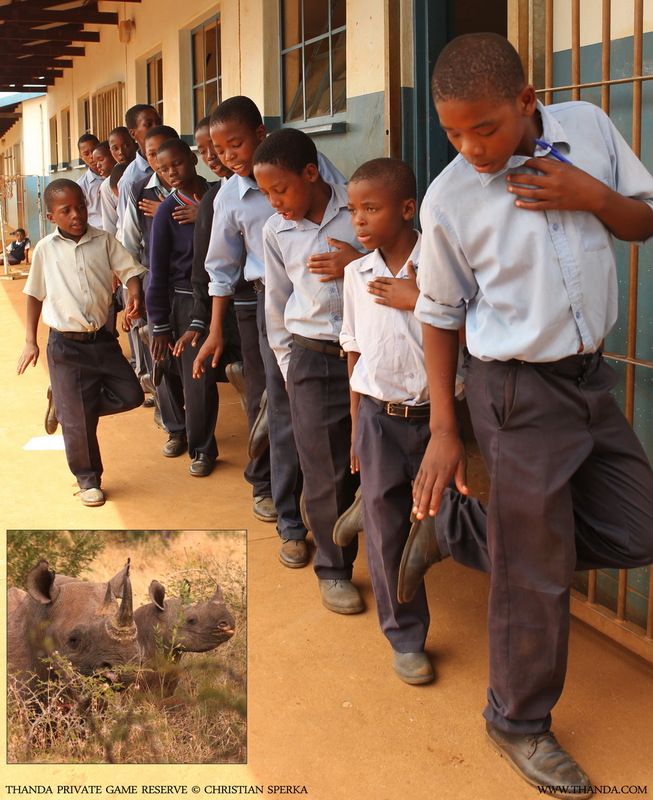 First images above: The school children were having fun running around the school yeard with one of the Thanda guests. The school children perform a few songs for the foreign guests. These boys were singing and dancing about the Black Rhino. A young lady from Spain in a friendly conversation with young students.